The AMG are back in Adelaide from the 5-12 of October. These games are always good fun, and I know already there are players coming from NSW and VIC to compete, because they know that SA holds great competitions and the Masters’ Games is one of them but is also a very friendly environment, well certainly after the game is finished. There were no worries about the hot weather policy this time, as the weather for Round 5 was unseasonably cool for March. A few spots of light rain punctuated the morning session but the sun came out later, making for a very pleasant afternoon. The competition was once again dominated by Eastern Suburbs, as has been the trend all season. In fact, this was the fourth time in five rounds that the club has scored more than fifty championship points and it has now amassed an awesome total and secured the title with one round yet to play. On this occasion it was Nick Armstrong, Alexi Alexi & Arwed Turon taking out the day’s honours – the third gold medal for Alexi and Arwed this season. 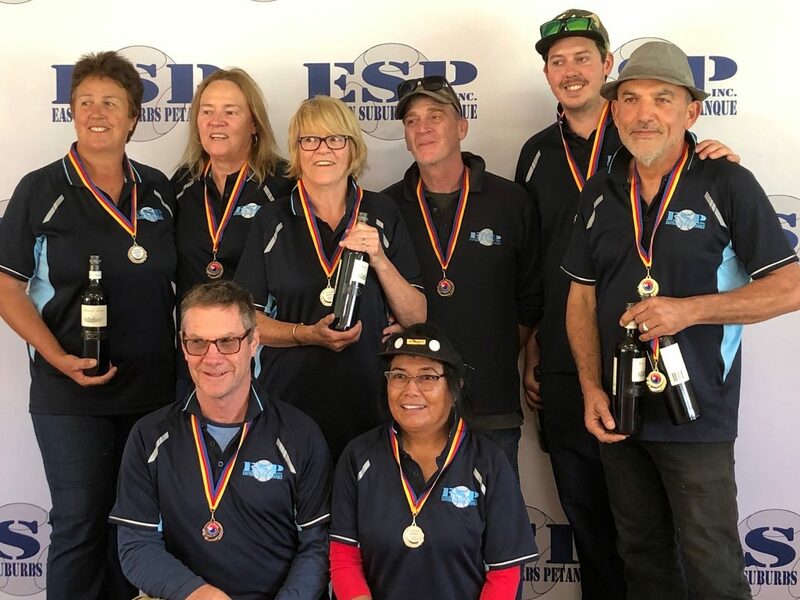 In second place were Deb Rodda, Selina Dally & Wendy Bensen, while Anna O’Connor, Marcus Marndaz & Ray Drummond finished third to complete the ESP trifecta. Surprisingly perhaps, in light of their strong record, this is the first time Eastern Suburbs have ever taken all the medals in a clean sweep. The State Triples competition to be held at Prospect on Sunday 23rd February has been cancelled under the SAPL Heat Policy. The competition will be rescheduled at a future date as yet to be confirmed. For details of the Heat Policy check here. 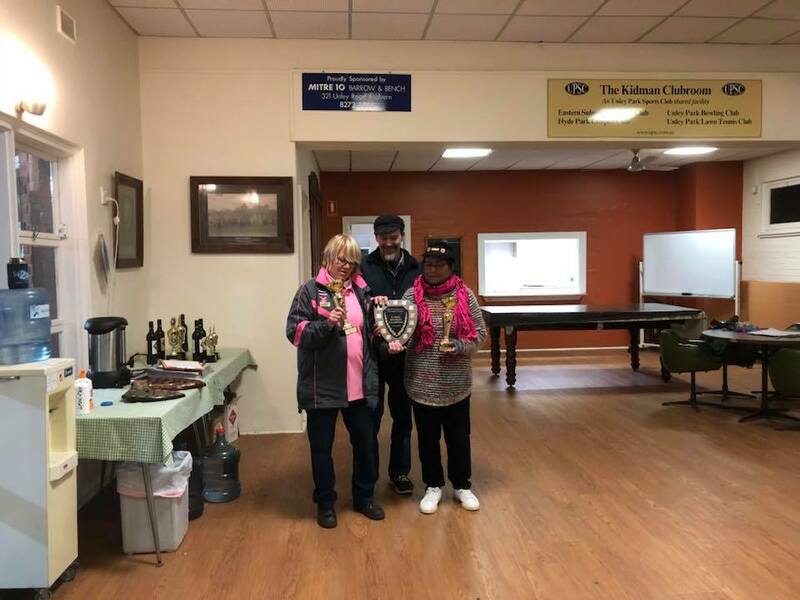 The January round of the Interclub competition fortunately fell during a brief lull between two prolonged periods of severe hot weather. In fact, it was almost chilly in the morning at Stirling as players arrived. However, it didn’t take long for the fierce summer sun to have an impact. The air temperature was not extreme by any means (29C maximum, believe it or not), but in the sun it felt hotter than that. Round 4 honours went to the most enduring team in the competition. 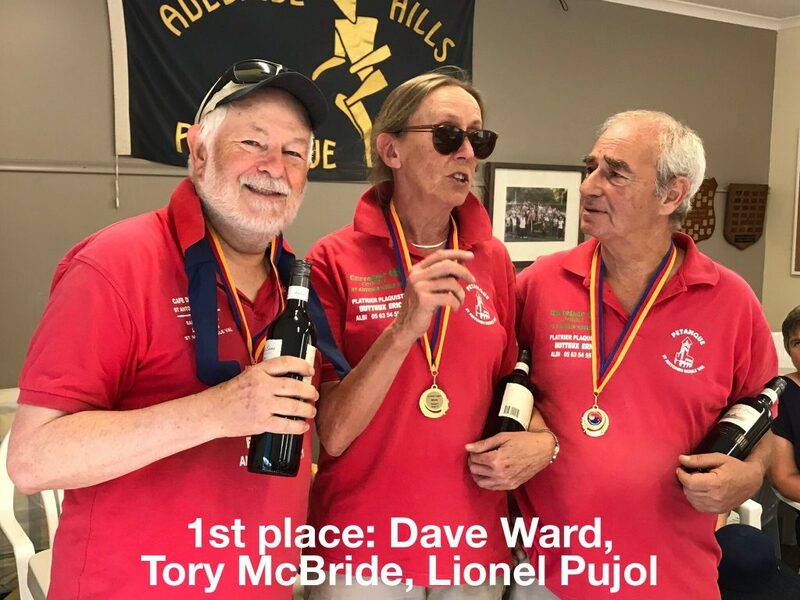 Tory McBride, Lionel Pujol & Dave Ward have played together as a set combination for many years and have been consistent performers. This victory makes them the first trio to win a League gold medal in each of four consecutive seasons. The silver medallists were Grant Ashmeade, Gavin Scott & Brett Williams. Glorious spring weather, delicious food, some tight games, some thumpings and, most importantly, lots of fun. The third Interclub round had it all, and an excellent turn-out of twenty-three teams were at the Club d’Adelaide to make the most of it. Players were kept on their toes by subtle changes in the playing surface over the course of the day, as the moisture from some overnight rain dried out in the warm sun. The major honours for the day went to the highly experienced trio of Alexi Alexi, Arwed Turon & Maurice Belz. This was Maurice’s first appearance in the Interclub competition since relocating to Adelaide from NZ. By taking out the gold, undefeated, and demonstrating some awesome skills along the way, he certainly made his presence felt and sent a warning to the rest of the competition. The silver medallists were Louis Oltarczy, Jean-Paul Bouyer & Tony Stojsic, who maintained the fine form they showed all last season. Through a quirk of the draw, this was one of the rare occasions where a second team gets through the day undefeated. Despite winning all three preliminary games, they only qualified third in their pool which denied them a shot at the gold, but they made the best of their situation after that. This year’s Mixed Doubles Championship was played under ideal conditions – mild temperature, warm sun, no wind, no rain, no hail, no fog. The sort of weather one normally gets at Stirling when there isn’t a petanque tournament on. As we’ve come to expect at this event, the atmosphere was extremely convivial and sociable – moreso than the other state championships. A bit less testosterone in the air, perhaps, because of the 50/50 gender balance. Perfect spring weather, some serious petanque and plenty of bonhomie were the rewards for a large turnout of competitors in Round 2. As usual, the Gawler club went all out to make it an excellent day, serving breakfast as well as lunch to the hungry petanquers. The 2018/19 State Doubles Championship was held at Eastern Suburbs in cool but fine conditions. Twenty pairs took part in this open competition including male, female and mixed-gender teams. The exceptional team was Raja Jamaleddine & David Lefer, undefeatedand never really threatened from beginning to end. They arrived with intent, talked the talk and then walked the walk, culminating in an awesome display in a one-sided final. Their very worthy opponents, Louis Oltarczy & Jean-Paul Bouyer, could find no way to halt the onslaught. This is David’s first state title since his win in the inaugural State Triples Championship in 2007. After something of a mid-life hiatus in his petanque career, he is back to his best. For Raja, meanwhile, his second State Doubles title completes his second full set of singles, doubles and triples crowns. Raja becomes the first player in the history of SAPL state championships to win twice in all three formats — an outstanding achievement. There was no separate women’s competition this year due to low numbers. However, as the highest finishing women’s team, Selina Dally & Deb Rodda retained the title they won last year. To prove that they thoroughly deserved this honour, they put on an outstanding display in the Open competition, finishing top of their pool in the morning session and going as far as the semi-finals in the afternoon. This extends Selina’s reign as women’s doubles champion into its fifth year. Finally, it is interesting to note that the first two teams to register for this event turned out to be the two finalists. What does that tell you? For more details see the brochure here. The first round of the new season was well attended despite the threat of showers, which fortunately did not materialise. Conditions were cool, but pleasant enough. Last year, in the 2017/18 championship, the pecking order was fairly well established after Round 1 and barely changed for the rest of the season. This time around, the early indications are that the season to come may be a bit more interesting than that. The dominant club on the day was Eastern Suburbs, with their three teams all finishing in the top five. Congratulations to the gold medal winners — Alexi, Arwed & Lionel. The resultant points haul puts ESP well ahead of the rest of the pack, at this early stage. Reigning champion Adelaide sits in second place, on the back of a silver medal performance by Dominique, Rada & Alain. 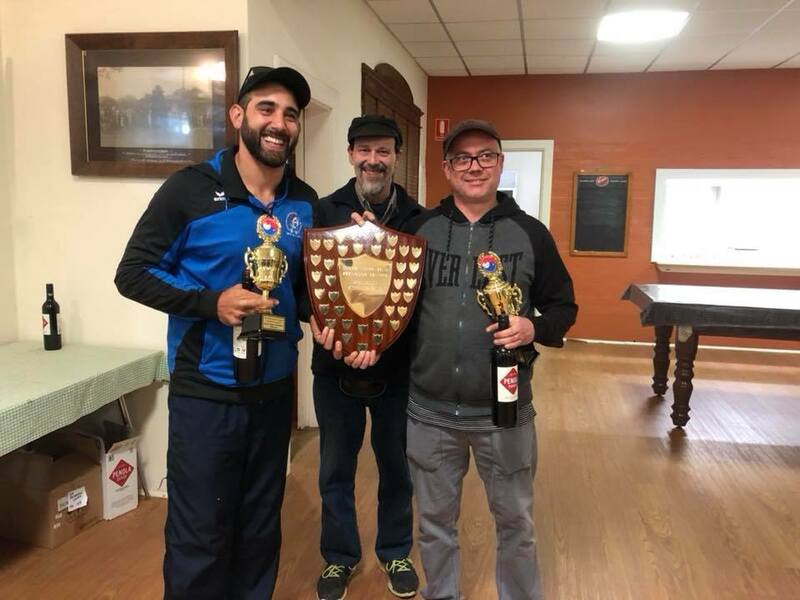 However, with a depleted squad and only one team in the points, they only just got their noses in front of the next three clubs who are all tied for third ‑‑ Adelaide Hills, Gawler and Prospect. Rounding out this tight pack are FAB, who, in sixth place, are a mere 6 points shy of second! Such a tight contest is good for the competition and leaves us eagerly anticipating the next round. Thanks to the Prospect club and all their volunteers for doing a great job as hosts.